In response to last year’s Black Friday actions, Walmart filed a lawsuit in Washington state court against OUR Walmart and its supporters alleging trespass and requesting a court order to prohibit future OUR Walmart actions inside and outside of Walmart stores. OUR Walmart fought the lawsuit and successfully persuaded the Washington judge to dismiss it because Walmart’s state court lawsuit violated federal labor law that requires Walmart to present its issues only to the NLRB. Walmart had filed an unfair labor practice charge with the NLRB prior to filing its lawsuit. This legal win means that Walmart cannot seek trespass injunctions against OUR Walmart or its supporters for future actions in Washington. The win will also help OUR Walmart’s legal team to make similar arguments in other states that have Walmart trespass lawsuits pending, including Ark., Calif., Colo., Fla., and Texas. OUR Walmart members have announced widespread protests for Black Friday in 2013. As Black Friday approaches, the campaign is asking allies to commit to supporting OUR Walmart members as they take action this holiday shopping season by signing the petition at http://bit.ly/15H42nj. New data released this week underscore the fact that smaller numbers of unionized workers mean less bargaining power, a weakened middle class and lower wages for everyone. On Tuesday, the U.S. Census Bureau released its annual report on incomes and poverty. According to the report, the median household income in the U.S. in 2012 was $51,017, and not much different from the 2011 median income of $51,100. However, when you look at the median household incomes over the last 25 years, the median household income in 1989 was $51,681—meaning that a typical middle class family earned more in 1989 than middle class families did last year. The nation’s official poverty rate in 2012 also remained stagnant at 15 percent, representing 46.5 million people who are living at or below the poverty line. Another study this week from Center for American Progress builds on the U.S. Census Bureau data and links the slide of middle class incomes to the decline in union membership since the 1960s. Between 1967 and 2012, union membership fell from 28.3 percent of all workers to 11.3 percent in all 50 states. 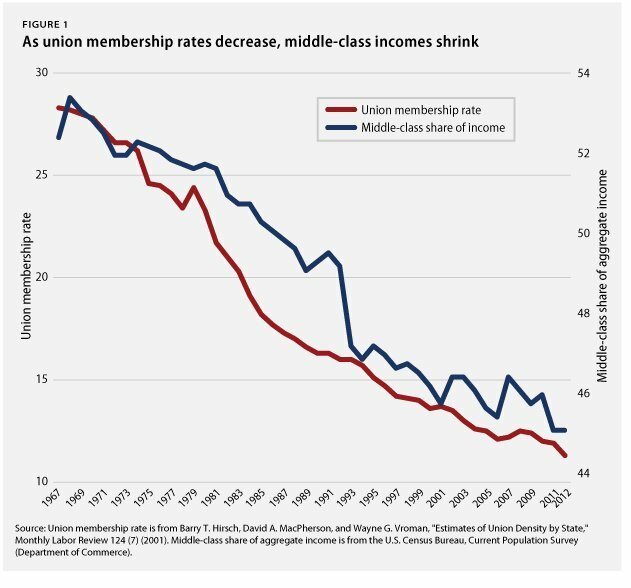 The decline in union membership is reflected in the decline in the share of the nation’s income going to the middle 60 percent of households, which fell from 52.3 percent to 45.7 percent over the same time period. As the gap between the rich and poor continues to grow, it’s clear that something needs to be done to rebuild the middle class. Making it easier for workers to stick together in a union to bargain for better wages and benefits is a good place to start. Delegates to the AFL-CIO Convention this afternoon passed a resolution expressing support for the goals of the Affordable Care Act (ACA) but also addressing a number of issues about the ACA’s implementation, including the way the ACA treats multi-employer health care plans. The resolution reiterates that the labor movement’s ultimate health care goal is health care for everyone under a single-payer model. AFL-CIO President Richard Trumka called the issues raised by the resolution ones of “fundamental fairness,” including if low- and moderate-income union members and their collectively bargained health care plans will be able to benefit from the same premium support that big insurance companies will receive and if they will have to pay fees to subsidize big insurance companies. There also are concerns that smaller employers will be able to get away with taking health care away from workers while paying no penalty. On Sept. 13 Indiana Attorney general Greg Zoeller filed an appeal to the ruling and it will be sent directly to the Indiana Supreme Court. If the ruling is upheld it would be a major blow to “right to work” laws nationwide and strengthen your right to join together with other workers and have a voice on the job. Extremist groups, right-wing politicians and their corporate backers want to weaken the power of workers and their unions through “right to work” laws. Their efforts are a partisan political ploy that undermines the basic rights of workers. By making unions weaker, these laws lower wages and living standards for all workers in the state. In fact, workers in states with these laws earn an average of $5,680 less a year than workers in other states.